Note – due to technical difficulties the paragraph layout and photos are not laid out how they are intended to be. Technology…I love it when it works how I want it to. Well, it’s been awhile since I’ve been able to get a post up, but I’ll leave the sob story for another day. But…I’m back! So let’s get to it…. 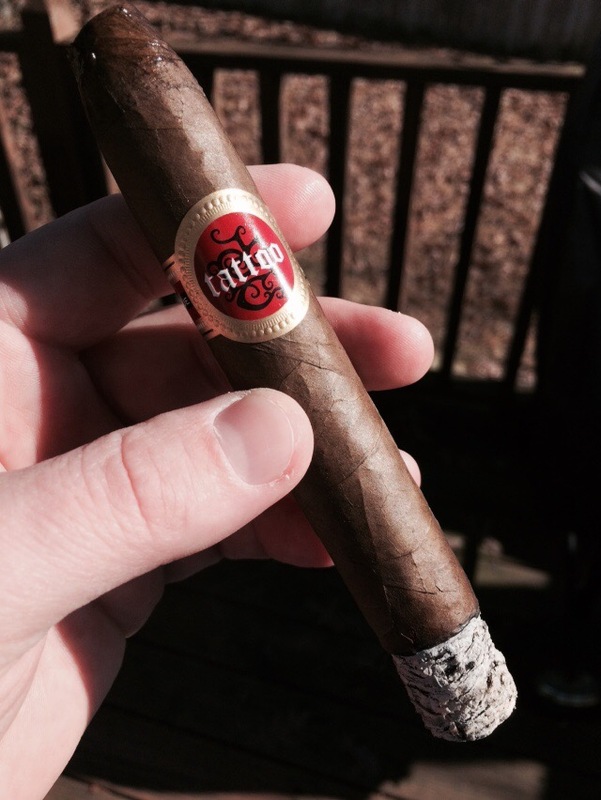 This past weekend I was able to enjoy a Tatuaje Tatoo. 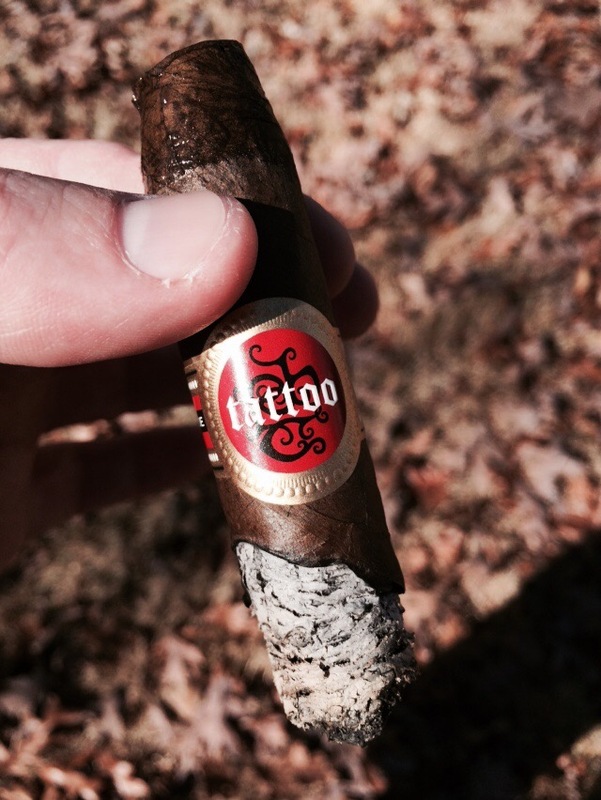 For those who aren’t up on their Spanish, “Tatuaje” is spanish for Tattoo, so this is a “Tattoo Tattoo”. It’s brought to you by the Department of the Redundancy Department. I kid. I kid. 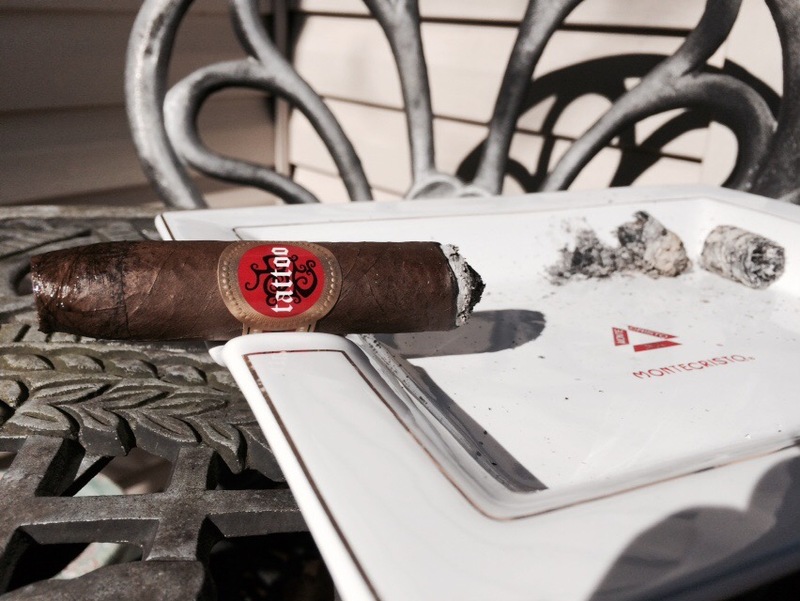 It’s a great cigar…read on! The design of the ring reminded me a bit of a medieval design. I don’t know the background of the design, so I won’t delve into what I don’t know. But if I were to venture a guess if you look closely you can make out a “P”, a “J”, and a “C”. 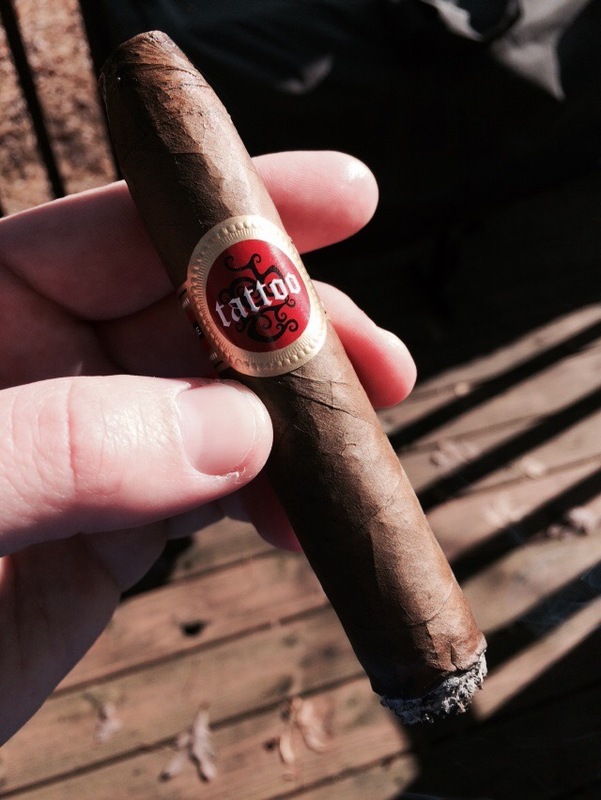 So my guess would be that stands for Pete Johnson Cigars seeing as Pete Johnson is the owner of Tatuaje. I apologize for not having the specific answer. 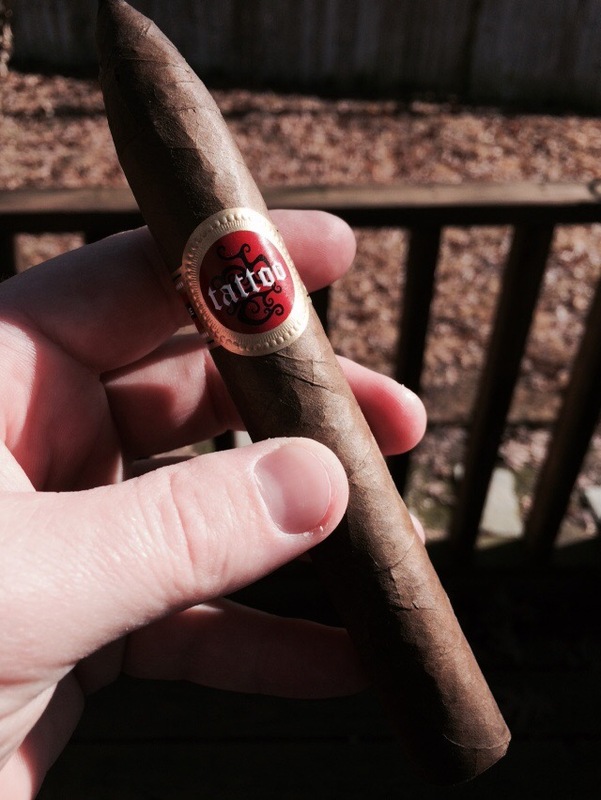 The torpedo is a new vitola for 2014. I won’t judge the burn too harshly seeing as I was outside on a rather windy day. It stayed pretty even throughout the smoke but did need to touch it up a bit in the final third. It also had a pretty ash – whitish gray. The ash would hold on for about 1-1.5”. The draw was a little loose, not too loose, but still a bit looser than what I prefer. Kindof a thin milkshake. 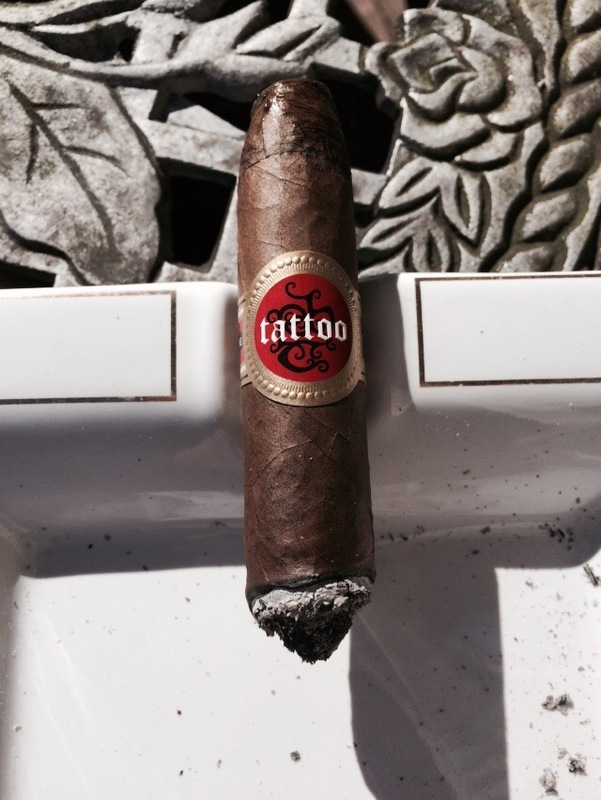 Even though the draw was loose it wasn’t a quick burner, and it produced a good amount of smoke which I like. Right off the bat there was spice and black pepper but with a sweet finish. Classic Pete Johnson. As the burn and the cherry settle in the flavors tend to favor woodsy notes…a sweet cedar is the best way I can describe it. It’s a very tasty, pleasing flavor. I could also detect background notes of citrus, and a little bit of leather. The finish was very short. 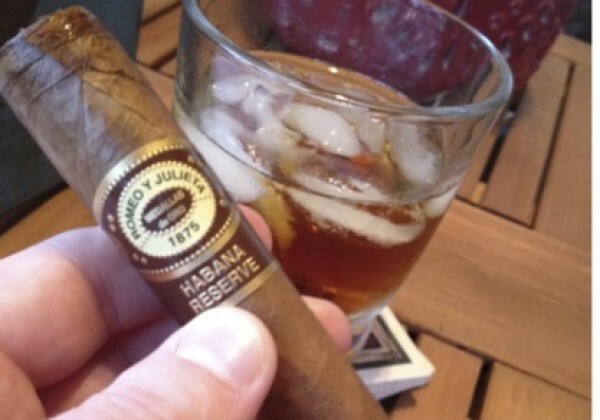 The flavors remained pretty much the same but the leather notes were more prominent. Still a sweet cedar but in the background there was a hint of a green banana flavor. Seeing that I love green bananas I enjoyed picking up on that flavor burst. The green banana flavor wasn’t around too long. 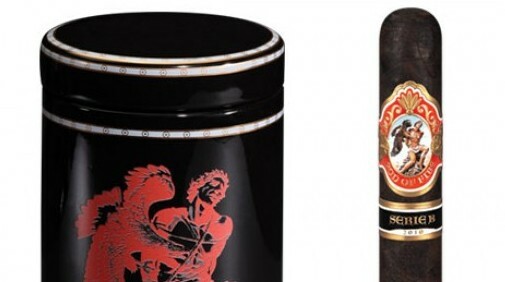 In the final third the most prominent flavor centered around a solid leather flavor. There were occasionally some background notes of dry hay, a little bit of nuts, and ended each draw with a sweet finish. 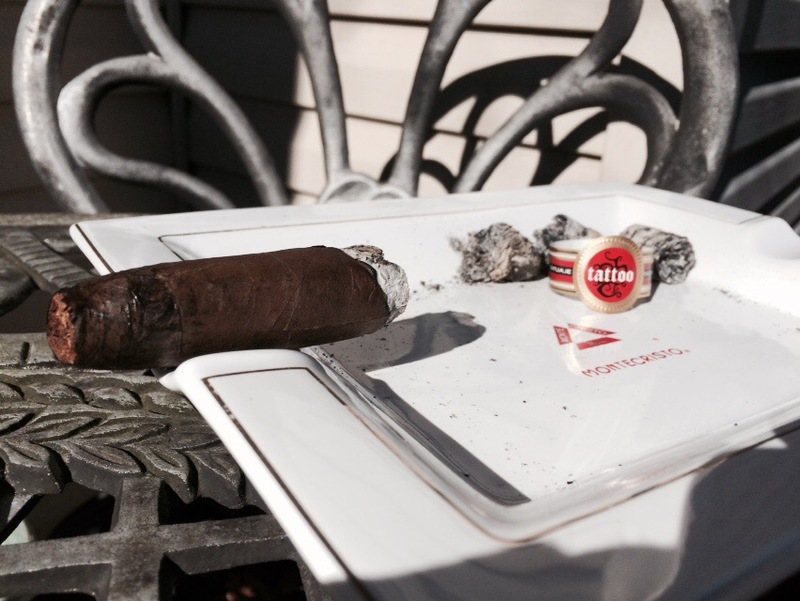 Definitely an enjoyable way to finish off the cigar. 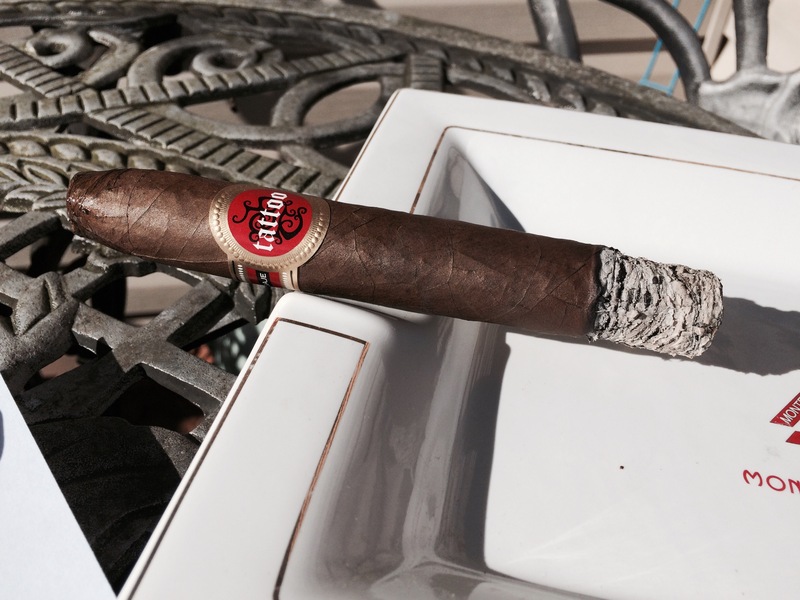 Definitely a good cigar, good price point…if I didn’t have it in the morning I might pair it with a scotch or a bourbon…ahhh, who am I kidding? I’d still have bourbon in the morning. Complexity – Fairly complex – cedar, pepper, citrus, leather, green banana bursts, and a bit nutty scores it as complex across my flavor wheel. 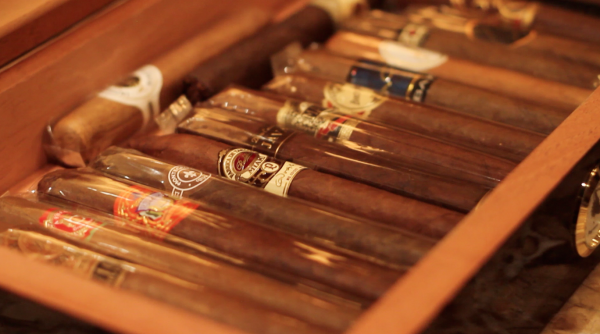 Golf or session cigar – I’d say it could be both. It was a bit windy while I was enjoying it outside while raking and it stood up well to the windy conditions. 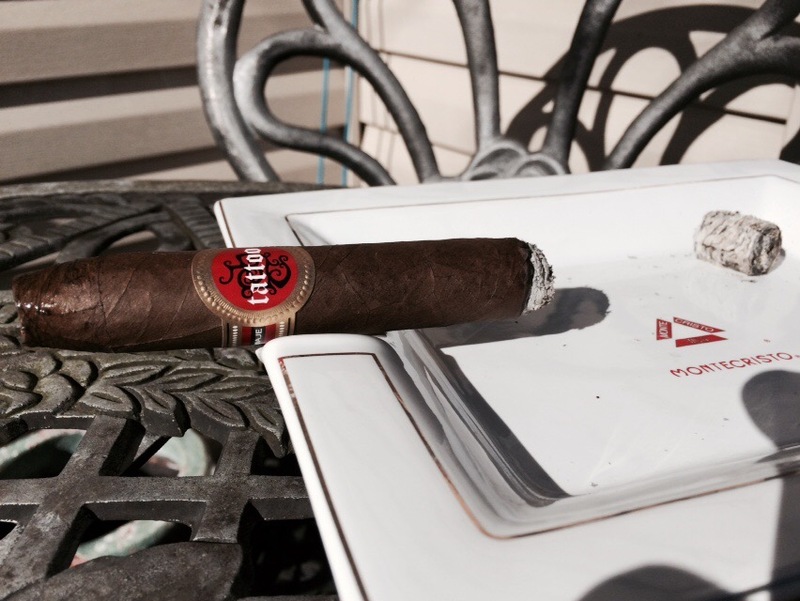 It wasn’t exceptionally long, but could be a great stick to finish off a round of golf. Smoke again? – Absolutely! 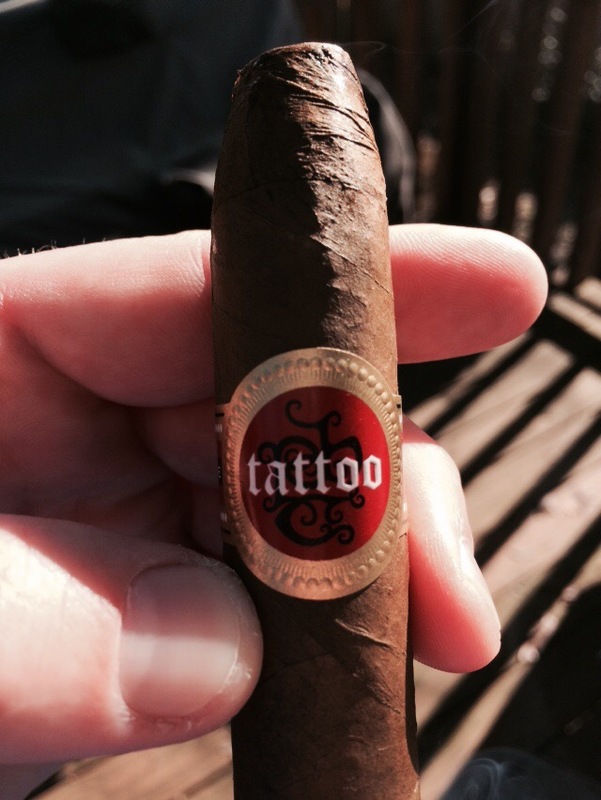 The flavors were right up my alley and the price point on this cigar – around $6-7 – makes it a great bargain.